Spray 4-quart slow cooker with cooking spray. In slow cooker, beat coconut milk, brown sugar, curry paste and fish sauce with whisk until smooth. Add chicken, broccoli, bell pepper and serrano chile to slow cooker; stir to coat. Cover; cook on Low heat setting 2 hours 45 minutes to 3 hours 30 minutes or until juice of chicken is clear when thickest part is cut (at least 165°F). Use slotted spoon to transfer chicken and vegetables to serving bowl; keep warm. Increase to High heat setting. In small bowl, beat cornstarch and water with whisk until smooth. Beat cornstarch mixture into sauce. Cover; cook about 15 minutes or until thickened. Add lime juice and basil; pour over chicken and vegetables. Serve with steamed white or jasmine rice. We tested this recipe with Thai Kitchen™ red curry paste. It’s worth noting, though, that different brands come with different heat levels, so we recommend using less or more, depending on the brand’s heat level and your own preferences. Canned coconut milk (not to be confused with cream of coconut) can sometimes separate into a thicker cream and a thin more watery liquid in the can. If you find that’s the case, just stir the two together until they are combined, and proceed with the recipe. Thai basil has a bolder, more licorice flavor than its sweet basil counterpart, although both can be successfully used in this recipe. You don’t need to track down a million different spices to prepare a well-seasoned curry. Thanks to a little thing called “curry paste,” you’re just a few hours away from a bonified red curry chicken. We coupled curry paste with creamy coconut milk and spicy serrano chilis and tossed them in with chicken into the slow cooker for about three hours. Three hours was the perfect amount of time to avoid overcooking the vegetables while allowing the chicken to cook through and reach peak tenderness. The cornstarch and water slurry used to thicken the sauce gives the curry that rich and silky smooth texture that we’ve come to expect from our curry. A delicious chicken curry that practically makes itself? 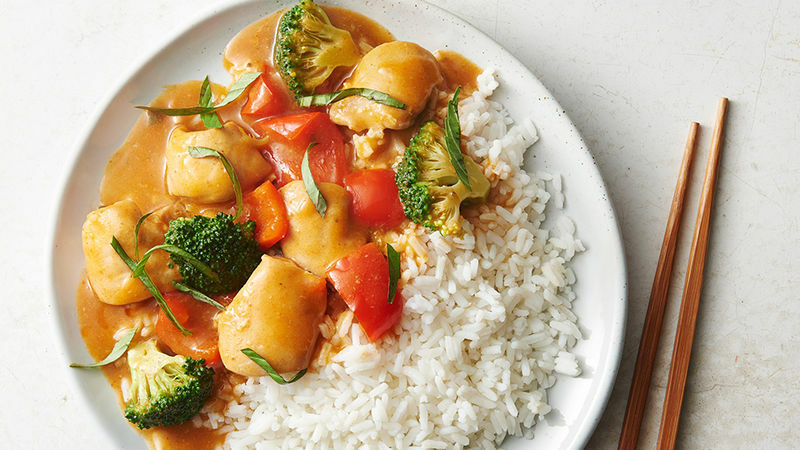 We’re going to go out on a limb and say that this slow-cooker red curry chicken is a curry lover’s dream come true. Keep the dream alive with more stellar curry recipes.